Nicola Leader is an artist living and working in West Dorset, where she was brought up and has lived for most of her life. 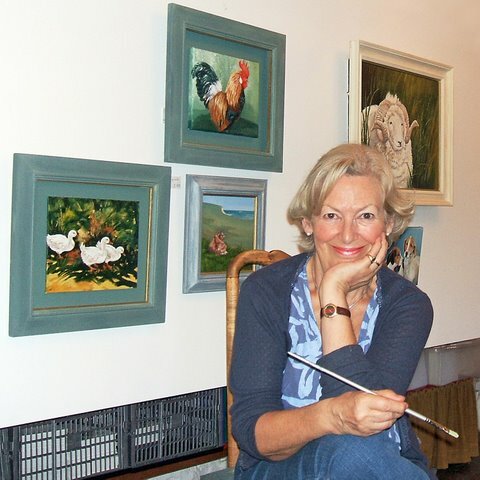 She has been passionate about painting since she was a child, but her career as a professional painter began in earnest 25 years ago when, after receiving a series of commissions for pictures of country houses in Dorset, she converted the hayloft above the stables at her home into a studio and exhibition space. The studio overlooks a parterre walled garden and an orchard filled with chickens - a favourite subject for Nicola. Over the past 25 years, Nicola's reputation has grown. She bases most of her landscape and seascape paintings on the beautiful West Dorset countryside around her, but has also captured scenes from Scotland, the Lake District, Pembrokeshire and France. Her paintings cover a wide range of subjects from wildlife, birds and flowers to farm animals and pets. She also paints hunting, shooting and fishing scenes. Nicola loves to paint her garden and animals, while her portraits of dogs are a particular speciality. Nicola has paintings on show in the hayloft gallery at her home and this is almost always open by appointment (01308 488417). This website presents some of her original artwork, past and present. Her watercolours and oils are small to medium size, but she has also recently produced some larger oil canvases of seascapes. Many of her paintings are reproduced as greetings cards, which are sold across the UK and are also available for purchase online.